MI VarnishTM with RECALDENTTM (CCP-ACP) enhances enamel acid resistance and boosts salivary fluoride levels. MI Varnish is a 5% sodium fluoride varnish that features RECALDENTTM (CPP-ACP), which is a special milkderived protein that delivers bioavailable calcium, phosphate, and fluoride to the tooth surface, releasing high levels of fluoride. 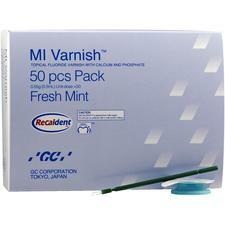 MI Varnish contains high levels of fluoride and calcium released in the oral cavity1. I love this product! I was very sensitive after home bleaching so I went to the office and applied MI varnish. I had instant relief and within an hour all pain was gone. I've used other varnishes for desensitizing but none worked this well.